On Saturday a very strong group of six players made up our top swiss. FM Leif Pressman came in at top seed followed by NM Daniel Lowinger. Lurking dangerously below them were young experts Jason Shi and Nicolas Checa. Peter Thau and Melvin Patrick rounded out the field. This section was brutally tough as Pressman conceded a draw to Shi in the first round. In round two, Pressman came dangerously close to being upset by Patrick but hung on to ultimately win the game. Meanwhile, Lowinger managed to win his first two games to lead going into the final round. Facing Pressman, Lowinger made a slight endgame mistake which his opponent quickly capitalized on and soon the game was over. Although Pressman rebounded nicely from his first round draw, winning his two final games, Jason Shi managed to keep pace with him and tie for first! Congratulations to all! In the second section, David Childs was the favorite, followed by Richard Arnold. Ellen Rosenfeld and Dream Teamer Bryan Weisz rounded out the field. 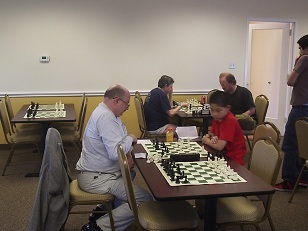 Child and Arnold got off to great starts, winning their first two games, setting up an exciting final round showdown. Rosenfeld faced off against Weisz and quickly converted her extra material. Childs v. Arnold came down to the last seconds with Arnold ahead in material and applying pressure to Childs’ king. However, at the last minute in all of the confusion Arnold blundered a piece! Unfortunately for Childs, he missed the opportunity to make a very nice comeback and instead was forced to trade off into a simple endgame which Arnold converted. Thanks to everyone who participated and we look forward to seeing you again next week!